I wanted to make it easy for visitors to find products and information. I wanted to make ordering supplements from my shop quick and convenient. All of my supplements, Books and Packages can be found on the bottom of the catagories list (on the left hand side of the page) at the bottom. Throughout the shop's pages you will see the usual links to other web pages. In most cases they will take you to relevant pages on my main information website DrMyhill.co.uk. Each link will open a web page either in a completely separate window immediately to the right of the current active window (i.e the "shop window") or will take you from one product to the next on the same web page. To return to the page you were on, please either click on the shop tab at the top of the browser window or push your BACK button (top left of the computor screen). In the example below, there are two tabs at the top of the browser window. 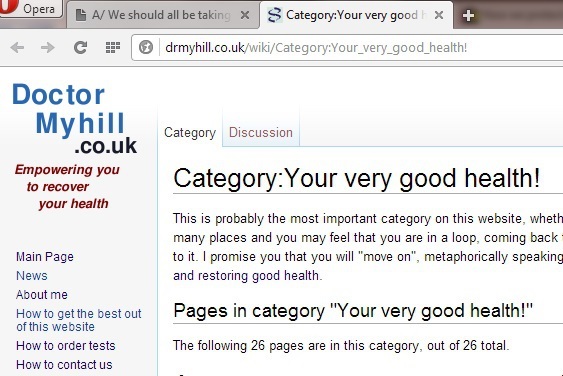 The current one is showing a page from my information website called Category:Your very good health! and the one to the left of it is the shop's tab (We should all be taking...). By clicking on it you will return to the shop.